The word Paella comes from the phrase, “para ella,” in Spanish this means “for her”. In the distant past in Spain, women and men ate separately. The men were served first with generous portions of poultry, sausage, seafood, and rice, and the women basically ate together and got the leftovers. Fortunately, the women had a strategy that created one of Spain’s most popular and delicious dishes, Paella. To create this dish, the women would sauté onion, vegetables, and rice over medium heat with Spanish olive oil and gradually add stock or broth. Next, they added whatever they had, such as poultry, sausage and seafood, such as shrimp, mussels, clams, squid, fish, and/or crab. They would season this dish with a few herbs and spices like paprika and oregano, but they saved the most precious spice for themselves, a few pinches of saffron threads, providing a delicious and fragrant dish with wonderful flavors. As this spice is extremely special and delicate, you don’t want to overload it with chili spices or other strong flavors. In the recipe I am sharing with you, I wanted to keep it simple and extra healthy. For protein options, I included shrimp, clams and/or mussels. There are no rules about which seafood you use – feel free to choose your favorite though some form of shellfish is a must. Seafood paella will include many of the seafood items listed above, plus you have the option to add pieces of poultry or meat as preferred. Despite the extended number of ingredients, this is an awesome, easy-to-make, one-large-pan dish that is ready to serve in 35-40 minutes, and provides a wonderful, satisfying meal, and the clean-up is easy, too. In Spain, I ordered Paella several times, but the obvious health problem with traditional paella is the excessive amount of rice that is included, and the gigantic, unhealthy glycemic load that comes with it. I considered that a healthier option would be to cut the rice volume in traditional paella by one third to one half but then discovered that substituting cauliflower rice makes this dish easier, quicker to prepare, dramatically healthier, and equally delicious. Cauliflower rice is essentially cauliflower that has been finely chopped in a food processor and works surprisingly well with these delicate flavors. You can process it yourself or purchase it already “riced”. The only challenge with this amazing dish is buying the classic spice, saffron. Saffron is one of the most precious spices in the world. It is expensive because it is an extremely labor-intensive crop, produced only with Crocus sativa, or the saffron crocus. Each flower has three tiny, thread-like stigmas in the center, and is typically picked by hand. The result is an amazing, concentrated flavor. Saffron may be hard to find (though now it is easy to order online), and ¾ to 1 teaspoon (which is 1/10 of an ounce) may cost anywhere from $5-10. If you can’t get it, you can still enjoy this dish without the saffron, although I hope you’ll find that the occasional treat in this amazing meal is totally worth it! 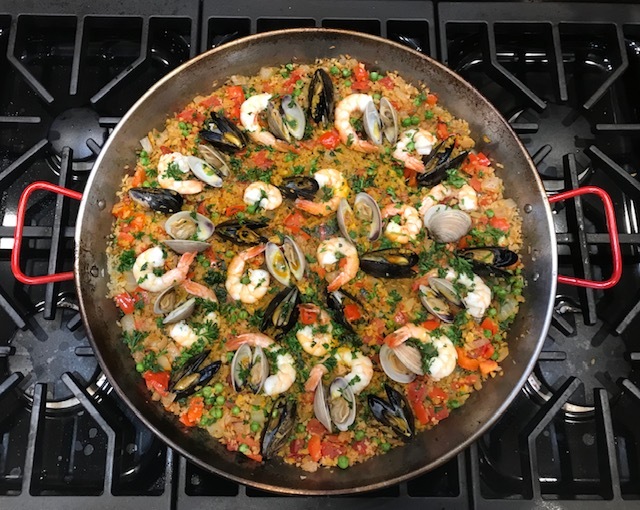 Heat a large pan (I use a 40 cm paella pan, you can also use a large 16-inch skillet, or two 8- to 9-inch sauté pans), to medium heat and add onions and salt and cook for 2-3 minutes, stirring intermittently until translucent. Add bell pepper and cauliflower rice, and cook another 2 minutes, stirring occasionally. Stir in paprika, oregano, garlic, tomato, broth, saffron, and sauté another 3 minutes, stirring as needed. Over this mixture, sprinkle peas, shrimp, clams and/or mussels (clams and mussels placed on their hinge so they open facing up). Reduce heat to medium-low and simmer covered with a lid or aluminum foil for about 12-14 minutes until seafood is nearly cooked and clams and mussels have opened. Avoid stirring after adding seafood to the pan, allowing base vegetables to develop a little crunchiness. Uncover, and simmer another 5 minutes. Serve immediately. Please share these recipes with your friends and family! You hit the nail onthe head! Thank you for all of the wonderful recipes! Have you researched cookware that is healthy to cook with, and possibly non-stick as well? Any suggestions would be appreciated. I avoid any coated chemical surfaces (like Teflon), and generally avoid aluminum. I prefer to cook on the stove with stainless steel, and use glass or ceramic in the oven. Caphalon is also a good option.